Sana’a: The Capital City of Yemen. In this post, I introduce my first art piece of 2018, in which I combine lettering and illustration. 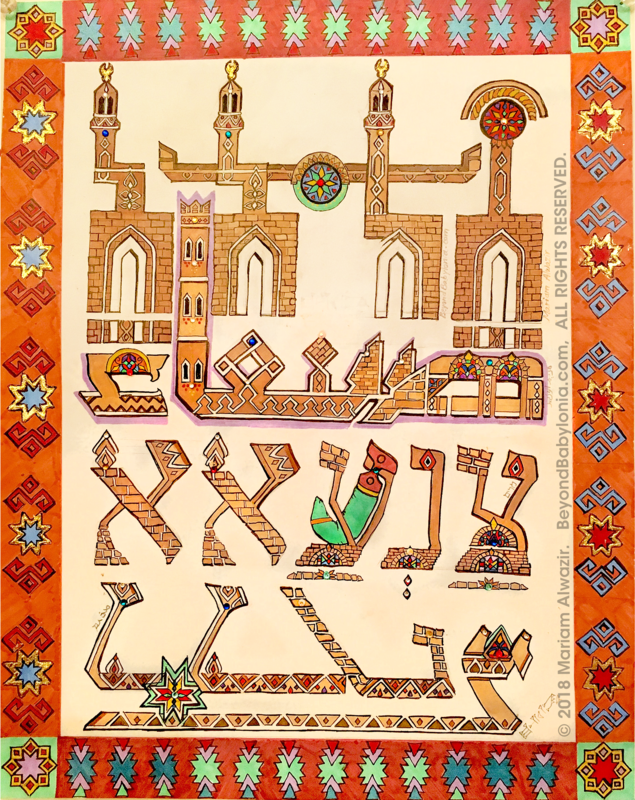 The concept of the lettering was to have Sana’a written in four different scripts: Sabaean, Arabic, Hebrew, and Syriac. Those languages fall into the Semitic branch of languages, have similar origins, as well as some shared vocabulary, yet each claims its own alphabetical system. The concept of the illustration was to have the multi-lingual lettering mimic the appearance of Sana’a’s iconic cityscape. 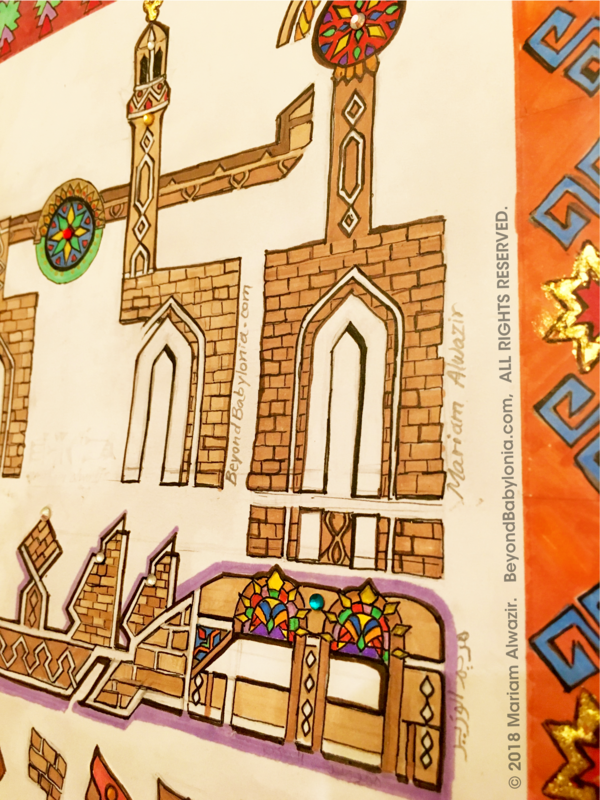 My goal for this piece is for it to convey the history of the diverse communities that inhabited Yemen throughout the centuries, and contributed to its heritage. The word “Sana’a” is derived from the Arabic root (Ṣ – N – ‘), made up of the letters, Tsade (*), Nun, and Ayin. Perhaps the city earned its name from the Arabic verb, صنع , (Ṣuna’), which means: to make or to manufacture (also: to construct, to produce, and to build). Sana’a is more than the capital city of Yemen — it is the ancient capital city of Yemen, said to have been founded and settled by Noah’s eldest son, Shem. Sana’a is more than the ancient capital city of Yemen — it is one that had been built, or maṣnou’ (**), from the rocks on the surface and up toward the sky. One that had been maṣnou’ from the very stones of its lush highlands, where the architecture could easily camouflage with its rocky environment, if it were not for the eye-catching stained glass windows that adorn every structure. Sana’a is more than just an ancient capital city with structures rising up from the mountains — it is one that is being rocked with instability caused by external aggressions and internal devastations, yet still full of resilient city folk who carry on with their lives in spite of all their burdens.
. . . and still, Sana’a is more than all that. Come to Sana’a; see and listen for yourself. As you approach it, see it mystically rise up from Yemen’s highlands. Once within it, listen carefully to the echoes of varied languages bounce off the ancient walls of the city. Watch carefully for graffiti in a variety of scripts, belonging to those languages. Sana’a was home to several languages and scripts that were spoken and written throughout the ages. Each of these languages have left their marks and diacritics over the southern regions of the Near East, which Yemen owes it’s rich heritage to. 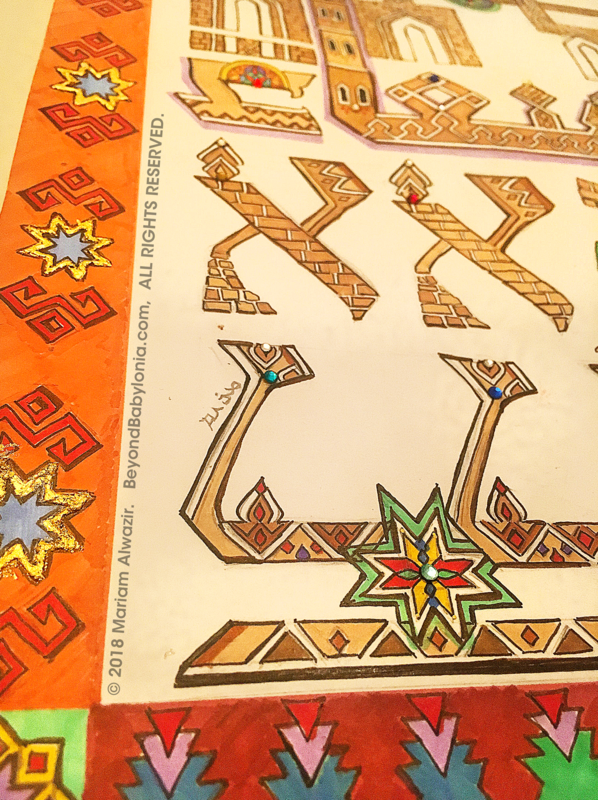 The trained eye will notice that the top portion of this Art piece does not only consist of minarets and arches, but spells out “Sana’a” in the Sabaean script (Ancient South Arabian), which is read from right-to-left. Pay attention and you will see the letterforms. It is thought that Ge’ez, spoken just across the Red Sea in Abyssinia, came from Sabaean. Just beneath the Sabaean script, I illustrated “Sana’a” in Arabic as صنعاء . Now this makes sense, as Arabic is Yemen’s official language today, and has been for some time. Under the Arabic, you will see צַנְעַאא in Hebrew. During the Himyarite Era of Yemen, which reigned after the Sabaean Era and spanned 630 years, Hebrew was the spoken language throughout the western parts of Yemen. Finally, at the bottom, ܨܢܥܐܐ in Syriac. If Classical Syriac ever made it down to Yemen, it would have had to travel from the north-east to the south-west. It is likely though, that Syriac may have had its debut in the nearby Yemen, since Syriac inscriptions have been found as far as the Far East. I do know that throughout the centuries, before Islam was introduced to the region, some of the dialects of Akkadian, Assyrian, and Aramaic have been used in south-western Arabia. 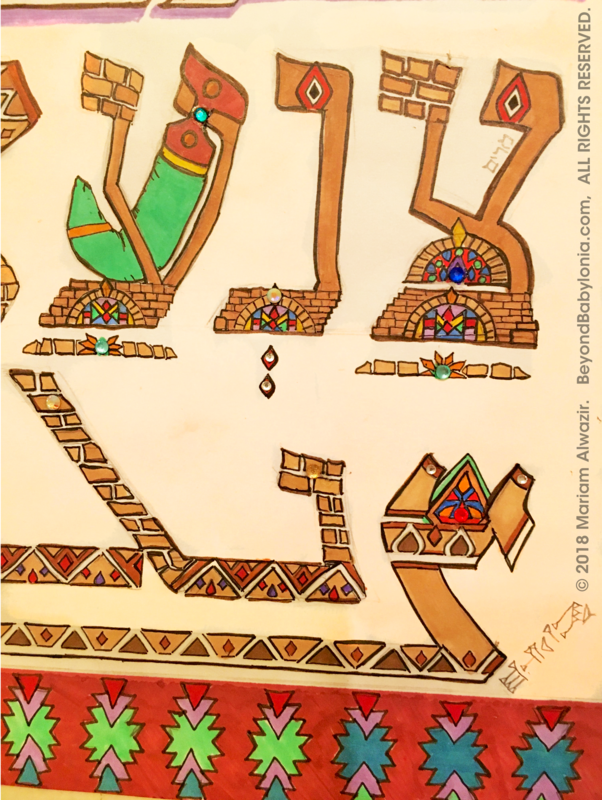 I encourage you all to search for more Art pieces that unify Semitic languages. Sabaean, Arabic, Hebrew, and Syriac: together, these languages (well . . . those who spoke them) built, or ṣuna’ou (***), Yemen’s heritage and its history. * The Ṣ sound in Sana’a is pronounced: “Ts”. ** maṣnou’ — (passive participle, past tense) “has been built from”. *** ṣuna’ou — (verb, plural, past tense) “they built”. 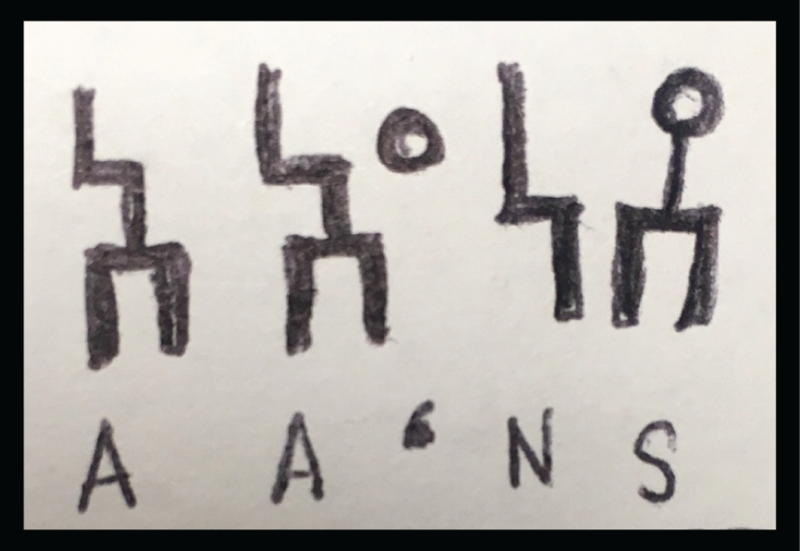 “Sana’a” written out in the Sabaean script. Materials Used: Prisma, Paris Paper, Gold Leaf, and fake Swarovski crystals. Yemen nowadays rarely makes headlines in the mainstream media, unless it involves protests or Yemen’s use of Qat. In the non-mainstream media, we see that Yemen makes more sombre headlines (but then again, at least it’s coverage): another airstrike, mass starvation, and the cholera epidemic. Little does today’s world know of Yemen’s positive characteristics — the brilliant and picturesque architecture; the vibrant poetic culture that gave way to Yemen’s underground art and music scene; the highly sought-after coffee, incense, and silver jewelry that Yemen, since ancient times, exported to other areas of the Near East. . . and beyond. 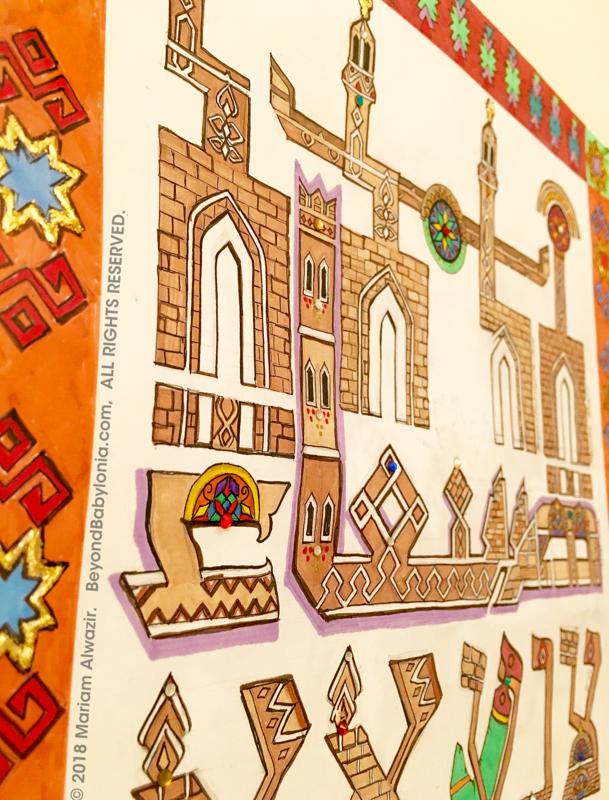 In this post, I shared some of Yemen’s cultural diversity. In any future posts that concern Yemen, I strive to give the world a taste of the many splendours found in Arabia Felix. Dear Ms. Mariam, great and insightful article. I enjoy reading it. Absolutely loved this, and love many of your other posts. Great and inspiring blog!